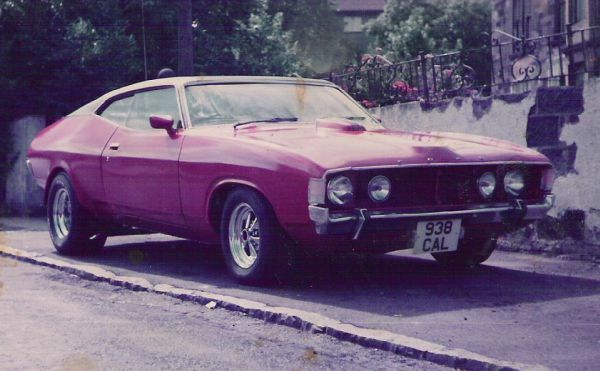 Since we started this register there have been a fair number of occasions in conversations with other car enthusiasts where we have mentioned Australian Fords and they have said, ‘Oh yes, there used to be one around here’ or ‘I knew someone who had one’. 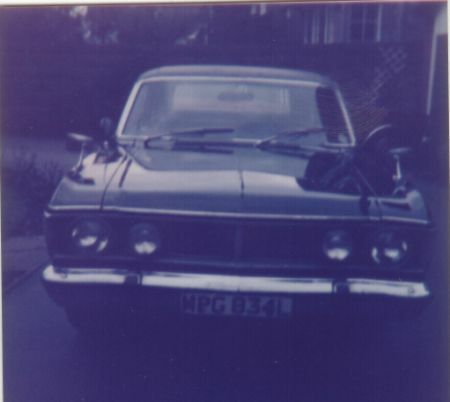 Well, this is a page to feature photos that we have acquired of Australian Fords of the past. Sadly, we have to start with the disappearance of one of the cars in our members section. 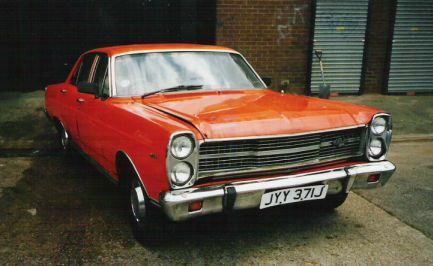 This ZC Fairlane was sold in the Leeds-Bradford area in March, 2003 and seems to have disappeared. If anyone knows where it is, please get in touch. 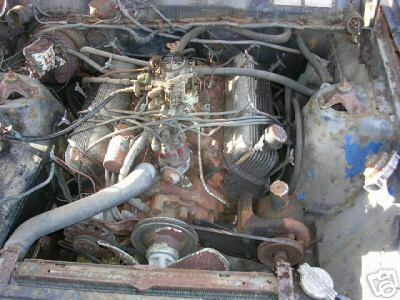 This is the ZD that Matt used to own, and which rusted away beneath him. 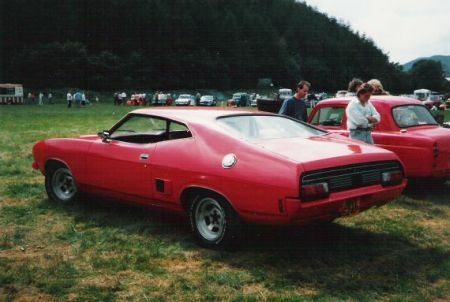 This is an XB GT which I photographed at a Custom and American car show in Central Scotland back in 1986 or 87. There are several points of interest to this car. 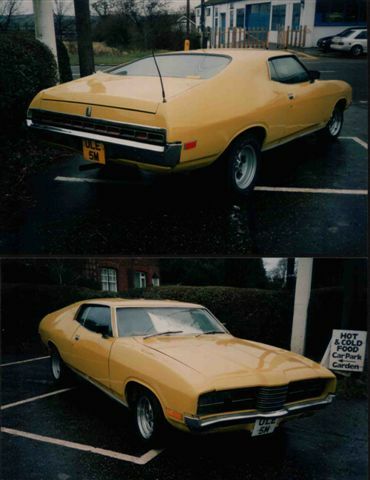 Firstly, it is one of the cars consecutively registered to my old GT and Mark’s Landau. Secondly, it is now one of the infamous ‘Rusty Scottish Falcons’, most probably the third one not pictured outside. 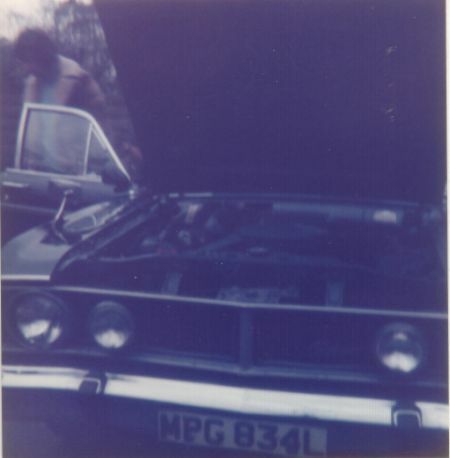 And thirdly, it too has the Triumph Dolomite tail-lights. Today - 30/10/05 - I have spoken to the one time owner of this car, who confirms that it is - or was - the front one of the two ‘Rusty Scottish Falcons’ and that it was originally Sky View Blue in colour with a Parchment interior. When checked against photos of the rusty Falcons, it can be seen that this one has the Triumph tail-lights. 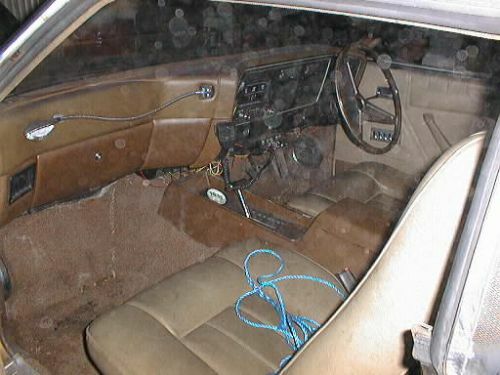 The other Rusty Falcon was originally white, probably Polar White, with possibly a white interior. 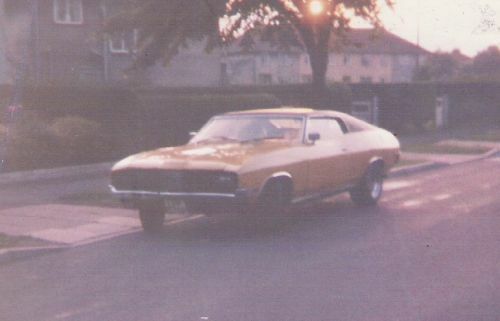 The third GT, which was in one of the garages behind the tow cars outdoors, was/is probably Burnt Orange. Thanks to Crawfy for this information. 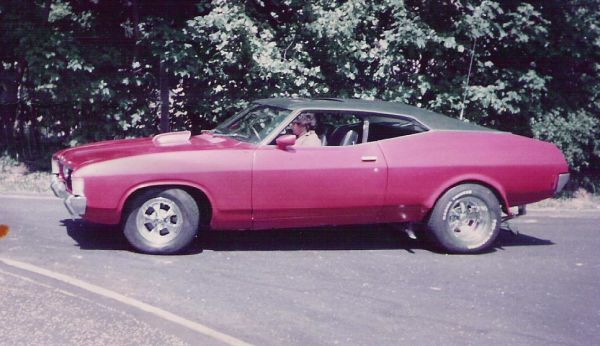 Hopefully he has many more pictures of this car when he owned it that he can send us. Crawfy also told me that ‘his’ GT had only 33,000 miles on the clock when it was acquired by the owner who left them to rust, and the other one - owned by Jim - had only done 26,000 miles. 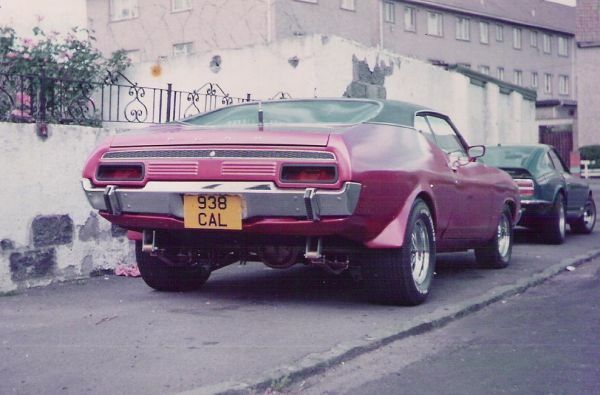 As we had both heard, there were apparently 6 hardtops acquired by Trust Ford in Dennistoun/Riddrie, four GT’s and two Landau’s, and they sat for many years, unsold, in a warehouse in the Glasgow docks. 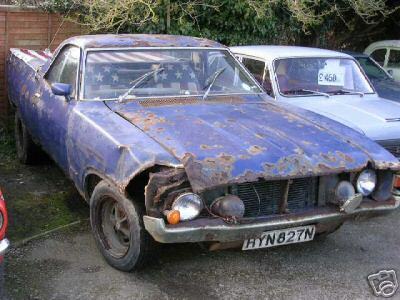 Crawfy recalls going to look at another car being sold by the owner of Blytheswood Motors in 1982, and on being taken taken to the warehouse seeing this big blue car sitting there, covered in dust. 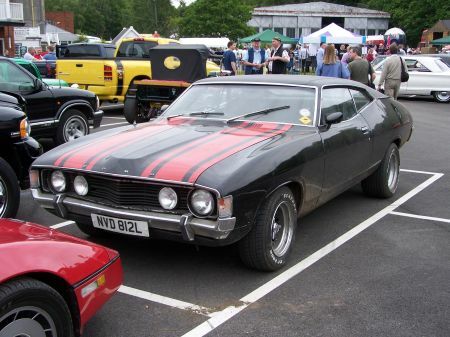 Blytheswood Motors is also from where Mark’s Landau was originally purchased by Malkie. 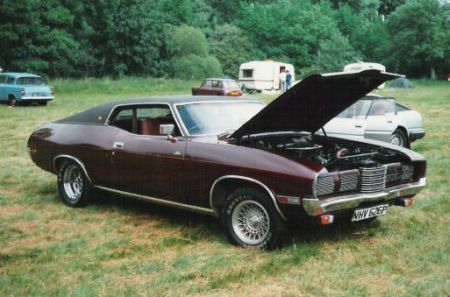 In fact, Mark’s Landau was at the very same show, and here it is in its original paint scheme. How nice to see it has survived and is well cared for. 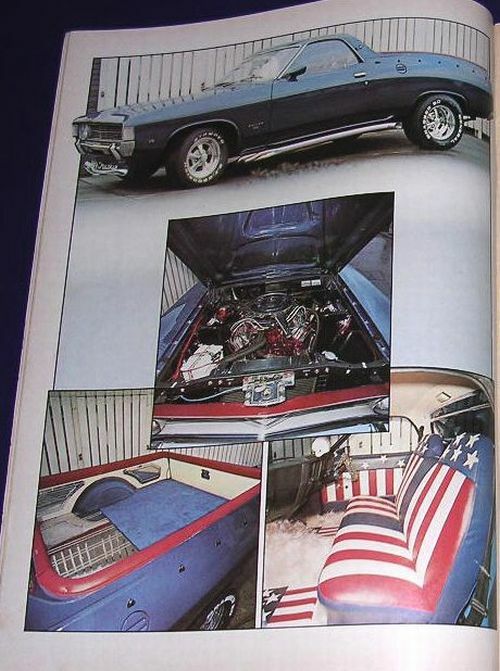 A piece that appeared in ‘Classic American’ magazine in 2004. Hopefully HW Perry will get in touch with us. These cars were for sale in 2002. An EA Falcon that sold on ebay UK for £250 in July, 2002 !! 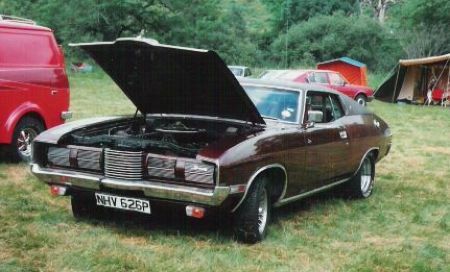 A Landau that sold on ebay, 24-11-04, for £1550. 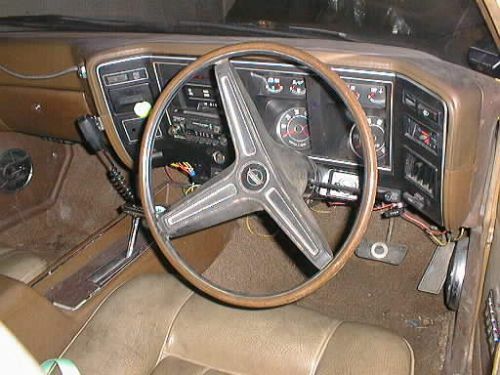 And the car as it used to be in 1993. Some more photos from Matt, some with a historical interest. 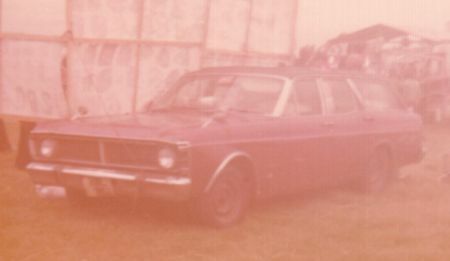 This is a bronze XY Fairmont that Matt saw and took a picture of at a grasstrack meeting in Hereford in the 1970s. It would appear to on an ‘L’ number plate. 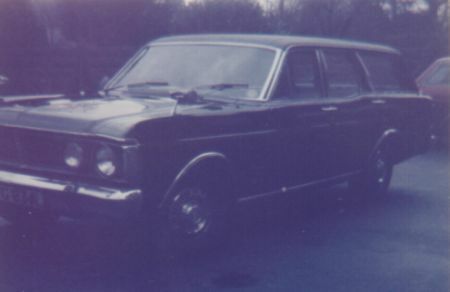 This is a black XY Fairmont wagon owned by Ed, a friend of Matt’s father. Does MPG834L still exist ? 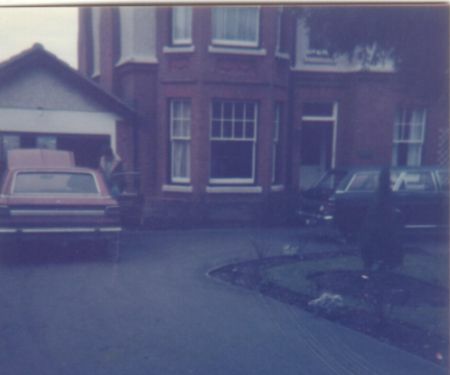 And this photo from ~1976 shows Ed’s black XY in the drive of Matt’s parenrs house, with Matt’s father’s first XY Fairmont wagon - YFN456K - in the drive too. Thanks, Matt, wonderful photos for an eight year old. 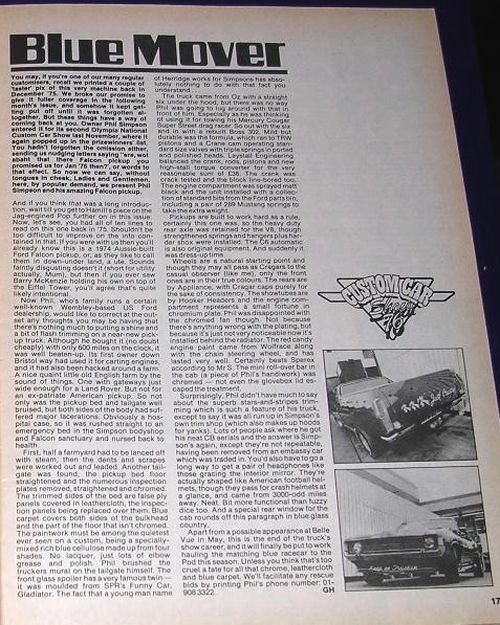 Steve from the Mopar Muscle Association contacted us with the rather startling news that he used to own a Ford Fairmont GT back in the eighties. 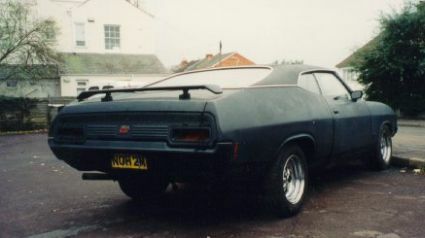 He swapped it for a Camaro and used it to tow his Dodge Challenger race car to dragstrips here in the U.K. He says it was really good car and an excellent tow car. Note the Dodge Challenger behind the GT on the trailer. There are a couple of interesting things here. 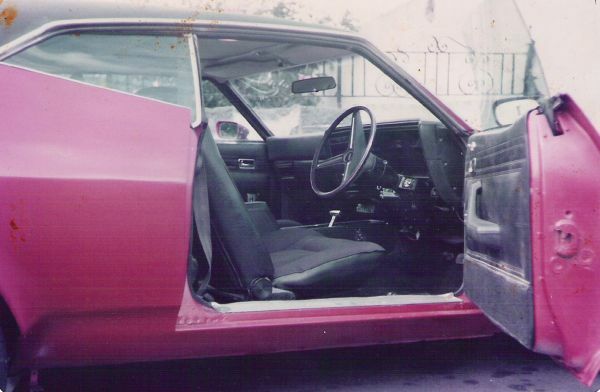 Firstly, while the car, being an XA GT has the cast metal ‘GT’ and ‘351’ badges on the front wings behind the wheel wells, it also has XB style ‘GT351’ sticker on the lower front part of the doors. 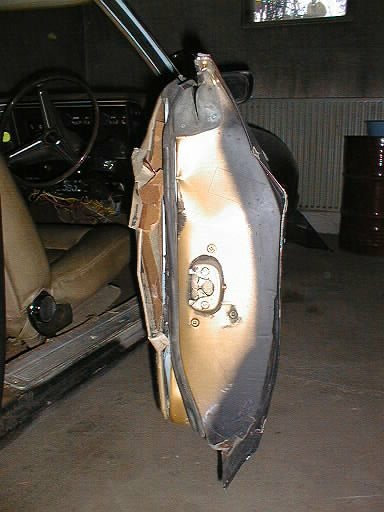 Did Ford in the U.K. do this, or did a previous owner ? 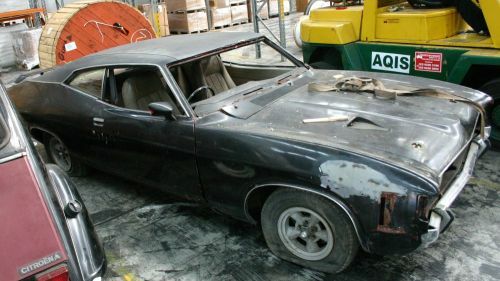 Also, remember this car from the rust section, the U.K. XA GT that was going back to Australia ? Notice any glaring similarity ? Quite how these two cars ended up with registration numbers so apparently similar, but, as anyone who knows the old registration system, so far apart is a mystery. 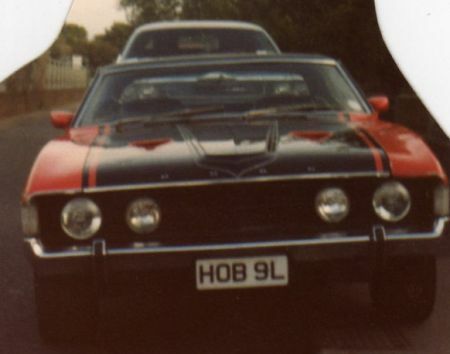 ‘OB’ and ‘OB’ are Birmingham plates, but could these be the one and the same car ? If so, how could the number end up one letter different ? 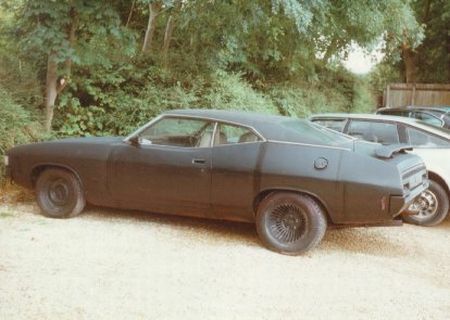 Although the ‘black’ car is black, it was also originally Red Pepper in color too, so it many respects, these cars are identical, the only difference I can see is that the ‘black’ car does not have over-riders on the rear bumper and Steve recalls his car having a black interior whereas the ‘black’ car has brown. Both have the U.K. style Triumph sourced tail-lights. Here is the car on its arrival in Australia. 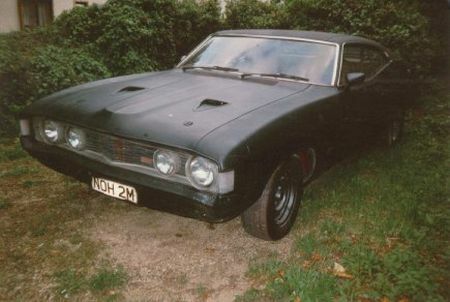 There is a mild mystery to this car as, although its VIN is known and hence it can be traced from Ford Australia to the U.K. Ford records and the data on its compliance plate shows that it has the ‘B2’ or black vinyl with cloth seat insert trim, it actually has parchment or saddle vinyl only seats. Strange. 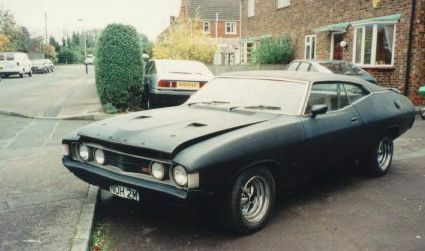 Here is another U.K. registered XA GT hardtop. We do know where this one is though. It is in Finland now. 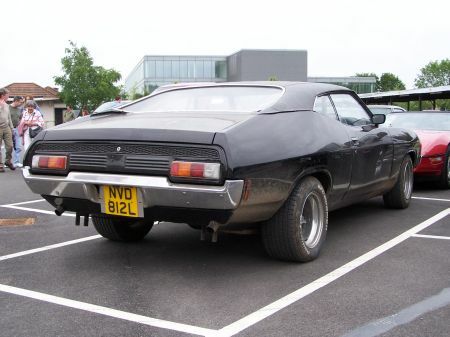 Note that it has the factory rear spoiler too. 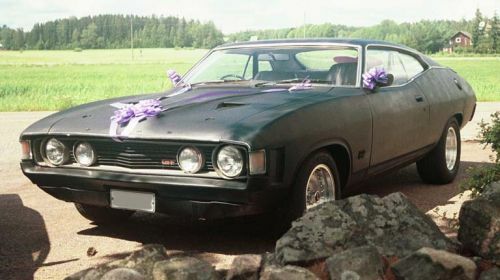 We were delighted to make contact with Sampsa, who owns this XA GT in Finland, and get some more information about the car from him. He bought the car in November, 1999 after placing a wanted advert in ‘Street Machine’ magazine. 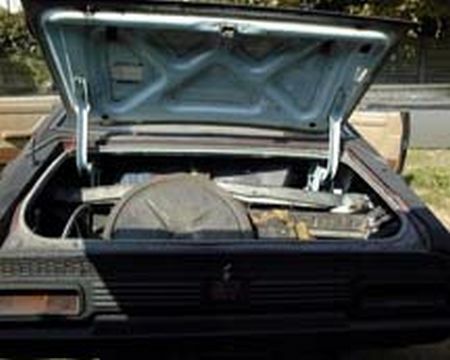 He flew from Finland with a friend and hiring a truck and trailer, took the car to Felixstowe for the voyage to Finland. The GT in the UK. 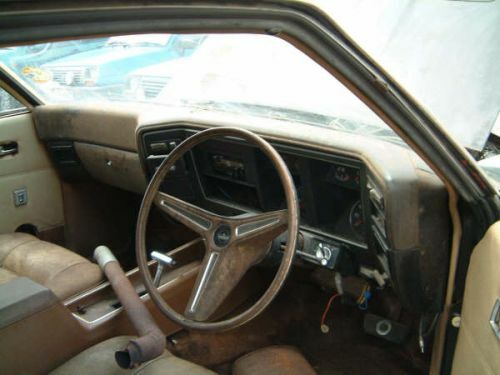 Based on the information Sampsa gave us, this is a very rare car. 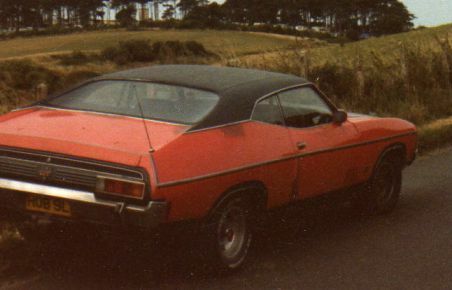 It was originally Skyview Blue, with a blue vinyl roof, and a parchment vinyl interior. 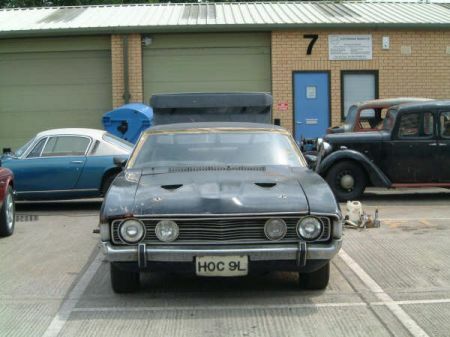 Ford only made two XA GT’s in Skyview Blue with blue vinyl roofs, and both came to the U.K. 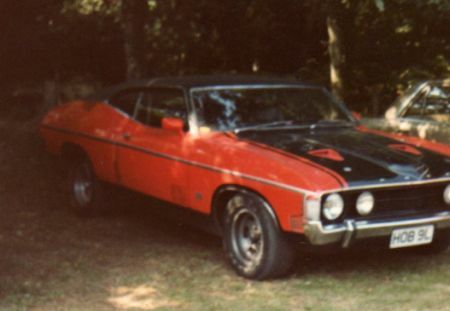 In fact, Ford only made four XA GT hardtops with blue vinyl roofs, and three came to the U.K. 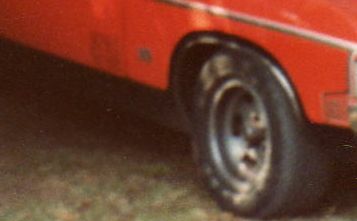 The third car was Blaze Blue. 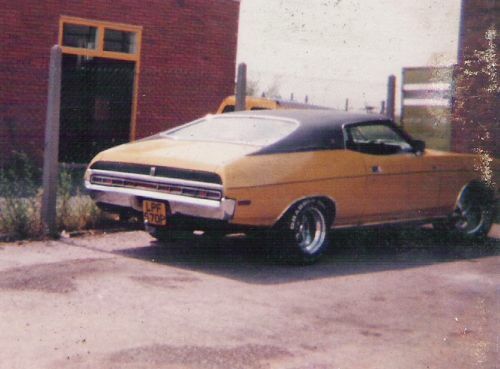 At some stage, Sampsa’s car was painted gold and the roof painted black. But traces of the Skyview Blue still remain, noticably in the boot. 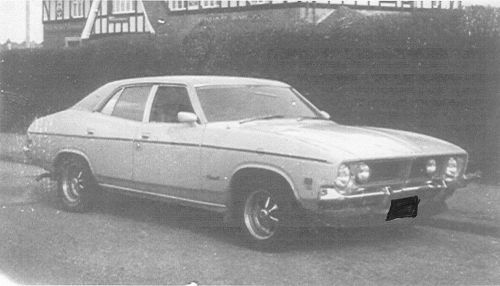 This car was first registered in the U.K. on the 1st of August, 1973 by Evertons Coaches Ltd of Chapel Bridge, Droitwich. Yes, it was a company car ! 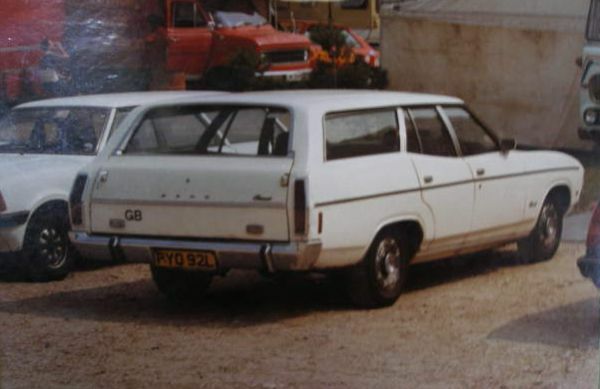 Here is another U.K. registered XA Falcon/Fairmont, a non-GT this time. 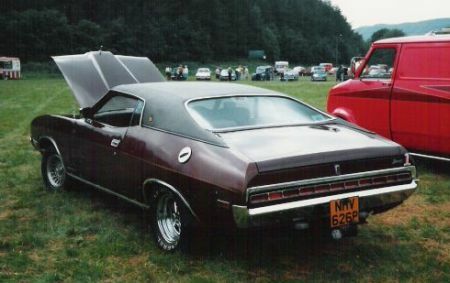 This car appeared at the MMA’s Mopars at Brooklands event at the end of May, 2005. Unfortunately, our contact there missed the owner/driver. Hopefully, he can get in touch. 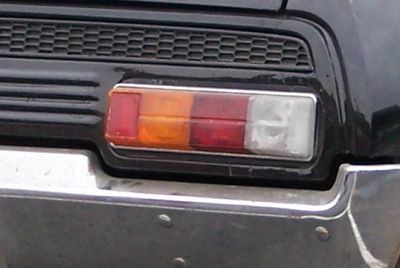 Interestingly, this car has the Triumph tail-lights, but they are inside out, with the reversing lights on the outside ? 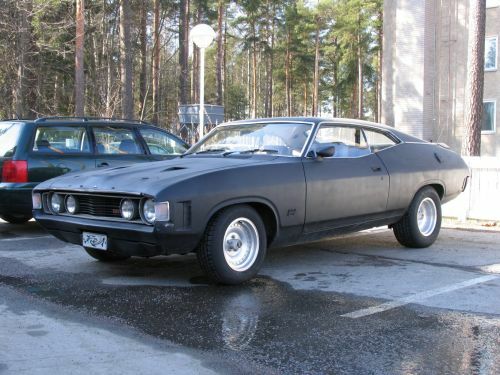 I am sure that this is the car that was advertised in Custom Car in 2000 or 2001 for sale. The red striped bonnet looks familiar. 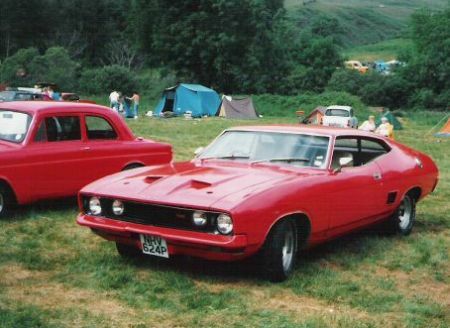 As is the case with Steve’s XA GT above, this is another Australian Ford tracked down through the Mopar Muscle Association here in the U.K. and formerly owned by Duncan, one of its leading lights, and like Steve, a racer of very fast Dodge Challengers. Maybe there is something about them. 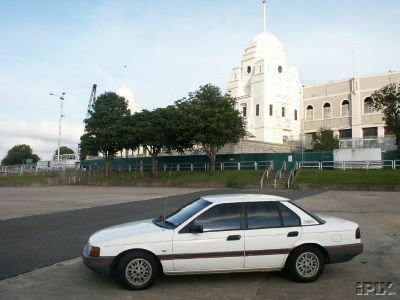 Duncan owned the car a fair number of years ago, but still remembers how plush it was inside, with its front and rear bucket seats, and how well it went. Thanks for the photos, Duncan. Here is a link to Duncan’s website. 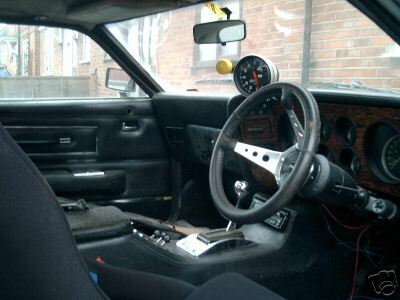 He is one of the top gearbox rebuilders in the country, as well as a great racer. 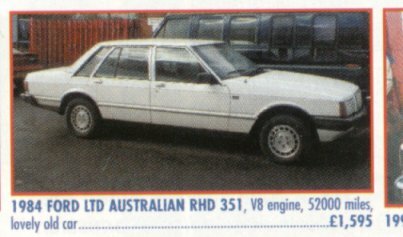 Andrew, who owns the XY GS in Australia, and which is featured in the ‘Bits and Pieces’ section, was sent this photo of an XB Fairmont. It was last heard of - by its seller - heading for the Southampton area. The car is interesting as it has the ‘Protection Pack’ featuring the side rubbing strip and the chrome bumper over-riders. 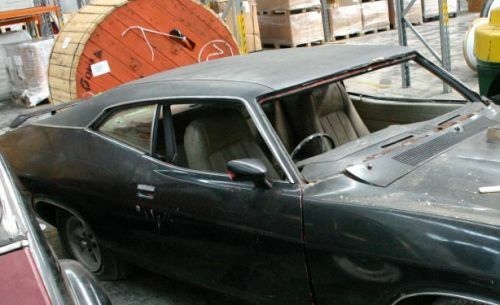 It also has front, and possibly rear, spoilers, twin mirrors and driving lights. Wonder if it is still around ? 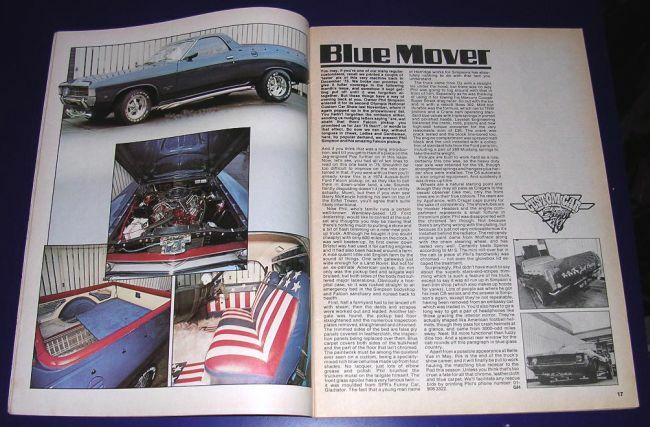 Here is an article from an 1977 Custom Car magazine featuring an XA ute called ‘Blue Mover’. 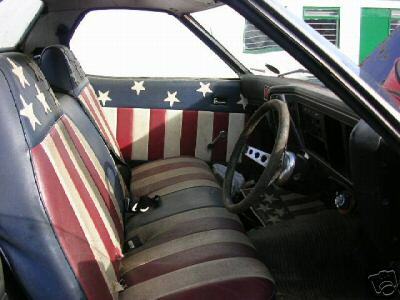 Quite strange to see an obviously Australian car with a star and stripes U.S. interior. Whatever happened to the ute ? 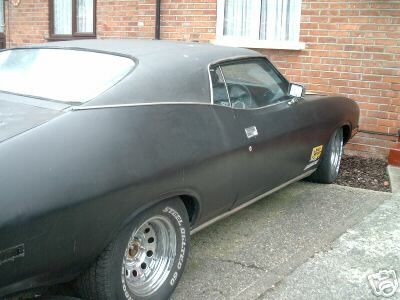 Well, just recently - March, 2006 - in appeared on ebay UK and was bought by Mark, the owner of the maroon Landau on this website. Some work to do, but it could look stunning when it is finished. Neale from New Zealand sent us this picture he took at Brands Hatch in the mid eighties when he was visiting the U.K. of an XA Fairmont station wagon. 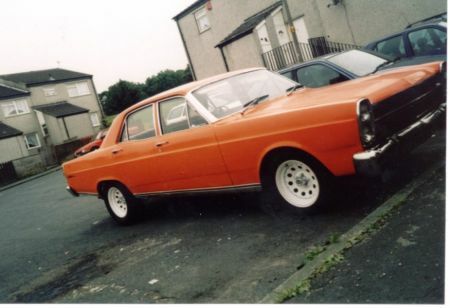 An XA Fairmont hardtop owned by Jim in Glasgow in the early eighties.